You should always take your time when brushing, spending at least two minutes on fully cleaning every area you can reach. By doing so, you can more effectively fight the accumulation of plaque, prevent the formation of calculus, and control your risks for gum disease and tooth decay. While brushing effectively can be a key part of your general oral health care strategy, it can be insufficient by itself. Flossing allows you to reach spaces that are difficult to clean with your toothbrush. When you take better care of your teeth at home, you can expect good news during your next checkup with your St. Louis, MO dentist. When you floss, you have the ability to target food debris and harmful bacteria that have gathered in those spaces between teeth. Without flossing, these sections of your teeth would be difficult to protect, as your toothbrush bristles can have a hard time accessing and engaging them. 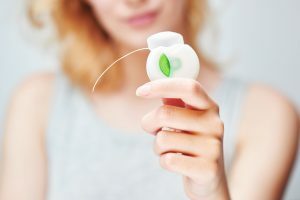 By moving the floss string up and down, and bringing the string down to your gum line, you can better manage the threat of cavities, and gum disease. You can manage your smile care on a daily basis by brushing, flossing, and committing to a quality diet. Nutrient-rich meals can help you stay in good health, particularly when you are taking care to limit your consumption of sugary foods and drinks. Calcium and fluoride are both important minerals for keeping your teeth in great shape. You count on finding calcium in dairy products, like milk, and fluoride can be found in many tap water sources. Maintaining an oral health care routine you are proud of can be important. What you should NOT do is assume that your routine can serve as a substitute for dental checkups. Every visit has important benefits thanks to your professional cleaning, which can clear away calculus, plaque, and food debris found on your teeth. Dr. Johnson can also warn you about problems with gum disease, or tooth decay. Cavities can actually be identified before you start feeling painful symptoms. Once a problem is spotted, the appropriate restorative dental procedure can be planned – early treatment can limit how much harm your tooth ultimately experiences. Ongoing appointments are important for adults, and they help kids protect their teeth, too! At Magnolia Family Dental, Dr. Johnson is proud to offer the kind of preventive dental care that can help you maintain an attractive, healthy smile. By providing expert care, and offering guidance on practicing better habits at home, we aim to give you the support you need to maintain good oral health. You can learn more information, or schedule your appointment, by calling Magnolia Family Dental in Kirkwood/St. Louis, MO, today at 314-822-4521.